Since 1973, the M-113 is the main APC in IDF service. However, it proved as totally inadequate for direct fighting, due to it's poor armor protection. The Israeli army introduced many improvements to the basic design (such as taking the main fuel tank out of the vehicle) and to the armor. Nagmash is the standard name for the American M-113 (acronym for Noseh Guysot Meshoryan - Armored Personnel Carrier). Zelda is an unofficial term used on a few occasions - Hebrew slang for an American Jewish girl. One of the lessons learned so costly at the Yom Kippur and Lebanon wars was the vulnerability of the armored personnel carrier (APC) in the modern battlefield. In the battle of Buq'atta (1973), for example, most of the 7th Recon Co was wiped out while trying to assault Syrian Commandos with their M-113's. The situation in southern Lebanon - where Hizbulla guerrillas ambush Israeli APC's and IFV's with ATGM's, mines and AT charges, also called for an improvement in APC armor. The "KASMAN" APC is an Israeli version of the M-113 with TOGA passive armor, hexagonal shield for commander's cupola, armored shields for cargo hatch and IS-10 smoke discharges. 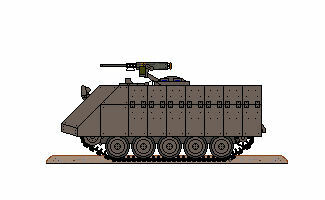 The "Nag Man" M-113 is an all new armored "block house" use on M-113's in urban areas. Includes hollow cast structure, clear resin glass block inserts, spot lights and clear yellow "flasher" light. Also external fuel cells and rear personnel door with vision block and firing port.